We are an organized group of individuals in the Kingman, Arizona and surrounding areas that get together to enjoy safe, fun rides and fellowship. 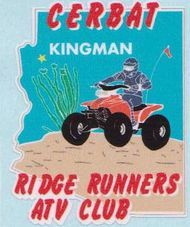 Visit our website: www.crrkingman.webs.com Click on “calendar” to find out about upcoming rides, activities or meetings. Our regular club meetings are held on the 4th Tuesday of each month at 6:30 pm at the Mohave County Library, 3269 N. Burbank St., in Kingman. Guests are always welcome to attend monthly meetings. Guests may also join the club on rides after they sign a waiver. All prospective members must fill out an application, sign a waiver and attend 3 events (rides and/or meetings). Then they are voted on for membership at regular meetings. When accepted for membership, dues of $12. per member over 18, or $24. per couple (includes family members under the age of 18), a year must be paid. We maintain a currently “members-only” (closed group) Facebook page to which new members, with a Facebook page, are given access upon joining our club. Members may purchase Club flags and Club logos. Club flags with pole are available for $10. by prearrangement at regular club meetings. Members may purchase clothing with approved CRR ATV Club logo at Lee’s Uniform and Embroidery, 3900 Stockton Hill Rd, Unit “O”,, Kingman. Prices vary with clothing selection and size. Call Lee’s at 928/692-5337. IF GROUPS OF RIDERS GET SEPARATED (SUCH AS AT A BREAK STOP) – ALERT THE TAIL GUNNER THAT YOU ARE NOW IN FRONT AND DON’T KNOW THE WAY. THEY WILL COME UP AND TAKE OVER AND ASK ANOTHER EXPERIENCED RIDER TO TAKE UP THE REAR POSITION.